By the Pseudo-Isidorian forgeries, scholars understand a vast and influential corpus of legal materials assembled by unknown clerical agitators in ninth-century Frankish Gaul. The attribution to Pseudo-Isidore is a mere convention, for the documents themselves adopt a variety of pseudonyms and historical perspectives. While forgeries abound in the Pseudo-Isidorian corpus, they stand alongside many authentic texts that the forgers have merely compiled. Other items have been corrected, interpolated or otherwise revised. The most imposing constituent of the forgery corpus, known as the False Decretals, was also the most widely read. At its heart lie nearly one hundred pseudonymous papal letters, or decretals, masquerading as the correspondence of popes from Clement I, Peter’s successor, through Gregory the Great. The Pseudo-Isidorians did their work in the archiepiscopal province of Reims, in the several decades preceding 850. New research has shown that they used the library of the monastery of Corbie on the Somme. Corbie scribes also produced some of the earliest and most important manuscripts of the forgeries. Though we know where and approximately when the Pseudo-Isidorians worked, their identity remains a deep historical mystery. Pseudo-Isidore’s origins lie in the ecclesiastical and legal maturation of the western Frankish church under Louis the Pious and Louis’s son and youngest heir, Charles the Bald. With the reforms inaugurated by Charlemagne, bishops in the Carolingian empire enjoyed a steady growth in their influence. As the political stability of the Frankish empire deteriorated after 830, however, the episcopate found itself subjected to new and unfamiliar pressures. An unsuccessful coup against Louis the Pious prompted the deposition of many prominent clerics, including the emperor’s milk-brother, Archbishop Ebo of Reims, at the 835 Council of Thionville. The Carolingian civil war that followed Louis’s death in 840 only deepened the uncertainty faced by the Gallican and the German episcopates. Pseudo-Isidore responds to these forces in several different ways. He strives to shore up the legal protections afforded bishops by enhancing or outright inventing a wide variety of procedural protections for accused prelates. Taken together, Pseudo-Isidore’s procedural program extends de facto immunity to accused bishops everywhere. The forgeries also seek to subordinate the Frankish church to the legal oversight of the Roman papacy. While Pseudo-Isidore’s view of a Rome-centered Christendom was an ideological conviction that he shared with some of his contemporaries, Rome also functions within the forgeries as a distant venue for appeals at the margins of Carolingian political power. By expanding the legal jurisdiction of the papacy, Pseudo-Isidore hoped to withdraw accused bishops and their trials from the influence of Carolingian rulers and the provincial synod. Finally, Pseudo-Isidore seeks to establish the near-absolute authority and autonomy of bishops within their own dioceses, and to protect the property of their churches from the depredations of the lay nobility. The earliest item associated with Pseudo-Isidore has been known to scholarship as the Hispana Gallica Augustodunensis, or the interpolated Hispana. The Collectio Hispana is an authentic two-part canonical collection from Visigothic Spain. Part I provides conciliar decrees from the Council of Nicaea (325) through the Second Council of Seville (619); Part II consists of papal decretals from Pope Damasus I (d. 384) through Gregory the Great (d. 604). This Spanish collection became known to the forgers in the form of a peculiar and corrupt subtype known as the Hispana Gallica. With the interpolated Hispana, Pseudo-Isidore struggles to correct the textual defects of the Gallican Hispana available to him; alters with understatement and delicacy several items of conciliar legislation and one papal decretal; and contributes a small dossier of three decretal forgeries in the name of Pope Damasus I. Only one complete copy of the interpolated Hispana has come down to us. It is Vatican City, Biblioteca Apostolica Vaticana, Vat. lat. 1341. It was copied by Corbie scribes in the middle of the ninth century. At some later date, the Pseudo-Isidorians produced a collection of what purports to be capitulary legislation, or secular laws issued by Carolingian rulers. A fictitious person named Benedictus Levita, or Benedict the Deacon, claims in a strange preface to have assembled these so-called False Capitularies from documents that he found on deposit at the cathedral archive at Mainz. He says that he did his work upon the order of archbishop Otgar, “bishop of Mainz at that time.” While Benedict is an invention, Otgar is a real figure, and he died on 21 April 847. “Benedict” therefore wrote his preface after this date. The False Capitularies run to 1,721 separate paragraph-length items, in the standard accounting; they are divided into three books and three or four appendices. While the entire framing narrative of Benedict’s preface is fictitious, many of the snippets that Benedict assembles are at base perfectly authentic. Some pieces have even come from genuine Carolingian capitularies. Among the items on hand in the collection are excerpts from the interpolated Hispana. The False Decretals were also assembled after the interpolated Hispana. They carry another fictitious preface, this one signed by Benedict’s counterpart, who gives his name as Isidorus Mercator, or Isidore the Merchant. The name is an amalgam of Isidore of Seville and Marius Mercator, and though it is this preface that has lent the name of Pseudo-Isidore to all of the forgeries, the Isidorian pseudonym occurs only here and only once. The decretal forgeries are, for the most part, intricate textual mosaics compiled from hundreds of authentic biblical, legal and historical sources. As in the False Capitularies, the forgers rarely write their own Latin, though Isidore presents his sources in far more heavily processed and digested form than Benedict. The False Decretals circulated only as a series of expansions to the interpolated Hispana. The enlarged collection consists of three parts: Part I contains sixty decretal forgeries from Clement I through Melchiades. Part II is nothing more than the conciliar decrees of the first part of the interpolated Hispana. Part III then provides the papal decretals from the Hispana, enhanced by dozens of additional decretal forgeries. The False Decretals alone reached a wide audience. Today nearly 100 manuscripts are known. The manuscripts transmit several versions of the False Decretals, which are still discussed according to the nineteenth-century classifications developed by Paul Hinschius. The fullest version, in three parts, is known in four variant forms termed A1, A/B, B and C. A short version, A2, provides only some of the prefatory materials from the Hispana, the sixty decretal forgeries in Part I, and an initial sequence of decretal forgeries from Part III. Modern authors also discuss the so-called Cluny Version, a subtype of A1 which omits the conciliar material in Part II. Crucially, Hinschius developed these classifications solely by comparing the contents of the manuscripts he studied. They do not proceed from a stemmatic analysis of textual variation. In all likelihood, a text-critical approach would gather A/B, B and C together in one branch, while likely discerning several different branches in the overbroad A1 category, with which Cluny and A2 are associated. 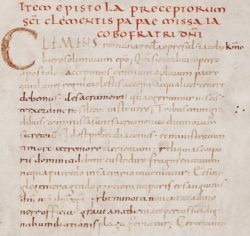 Many long-form decretal manuscripts conclude with a series of appendices. One of these is a précis of Pseudo-Isidorian procedural provisions that, according to a fictitious rubric, Pope Hadrian I gave to Bishop Angilram of Metz. It is known as the Capitula Angilramni. Another such appendix, only recently unmasked as a Pseudo-Isidorian concoction, amounts to a series of lightly enhanced excerpts from the Council of Chalcedon. It is called the Excerptiones de gestis Chalcedonensis Concilii, or the Chalcedon Excerpts. Other minor forgeries, among them the so-called Collectio Danieliana and a decretal in the name of Pope Gregory IV, circulated apart from the major constituents of the forgery corpus. Scholarship on the Pseudo-Isidorian forgeries has reached a crossroads. The traditional view held that the False Decretals drew on the False Capitularies as an intermediary source. Benedict’s preface, with its implied terminus post quem of 847, therefore seemed applicable to the False Decretals as well. Together with the first glimmerings of an indirect tradition in 852 (very probably) or 857 (certainly), scholars thus placed the forgery enterprise between 847 and 852/7. This drove them to read Pseudo-Isidore in light of the pontificate of Archbishop Hincmar of Reims, who from his consecration in 845 became one of the most assertive, learned and influential clerics of the Carolingian era. Pseudo-Isidore’s mild antipathy for archiepiscopal jurisdiction therefore became a sign of his opposition to Hincmar. This traditional view fell out of favor with the turn of the twenty-first century, as Klaus Zechiel-Eckes announced that he had discovered three manuscripts, two of them from Corbie, which Pseudo-Isidore or his secretaries had annotated in the course of research. This discovery confirmed older indications of ties between Corbie and the forgery enterprise. For Zechiel-Eckes, the Corbie connection showed that the forgeries developed far earlier than the traditional theories had supposed, in the immediate aftermath of the 835 Council of Thionville. Zechiel-Eckes preferred to read the False Decretals and the False Capitularies as parallel, rather than sequential, developments; and to ascribe the forgeries to Paschasius Radbertus, or Radbert, a learned theologian and later abbot of Corbie. For many modern scholars, Pseudo-Isidore has therefore become an opponent of Louis the Pious rather than an enemy of Hincmar, and the product of a dissenting monastery rather than suffragan bishops of the Reims province. Of Pseudo-Isidore’s contemporary readers, only Hincmar voiced suspicion, and then only with respect to isolated pieces. From the first moment of their circulation in the 850s and for two decades afterwards, the forgeries sparked a series of controversies and litigation between Hincmar and his subordinates. Ultimately, Hincmar emerged victorious and Pseudo-Isidore’s radical legal vision was set aside, but these quarrels ensured that the the forgeries, especially the False Decretals, came to be widely copied and read within the Frankish kingdoms and at Rome. Gregorian reformers in the eleventh century rediscovered Pseudo-Isidore and folded his expansive provisions on behalf of Rome and the papacy into the canonical tradition. The Pseudo-Isidorian forgeries were not revealed as fraudulent in a systematic and definitive way until the analysis of David Blondel, a noted French Calvinist classicist and historian, in 1628. On the whole, the Pseudo-Isidorian forgeries have not been successfully edited. Only the Capitula Angilramni and the Collectio Danieliana are available in modern critical editions, both of them the work of Karl-Georg Schon. The interpolated Hispana was transcribed by Annette Grabowsky in 2007, but otherwise remains unedited. The False Capitularies are the focus of a separate editorial project under the aegis of the Monumenta Germaniae Historica; the most current edition, by Georg Heinrich Pertz, must be used with caution, and strictly speaking it may be better to cite the early modern edition Étienne Baluze. The False Decretals have been edited twice. In 1524, Jacques Merlin printed them from a C-recension manuscript; his edition is available in vol. 130 of the Patrologia Latina. In 1863, Paul Hinschius surveyed the medieval manuscript tradition for the first time and published, in great haste, the Decretales Pseudo-Isidorianae. His text represents the A1 recension, and despite manifold defects, some of them crippling, it is still the best in print. My project, also under the auspices of the MGH, is to produce a new and reliable modern text of the decretal forgeries. The full enterprise will probably last thirty years, considerably longer than it took Pseudo-Isidore to compose and compile his forgeries in the first place. To provide the intervening generation with something to cite, I aim to publish an electronic single-manuscript edition of the False Decretals from Vatican City, Biblioteca Apostolica, Vat. lat. 630 (volume 1 and volume 2), over the next several years. This introduction and the website that hosts it are under still under (the latter phases of) construction. If you notice any errors or have suggestions, please leave a comment or write to me. Dear Colleague, I am not at all a specialist of Canon Law. Of course you know the manuscript of Pseudo-Isidore in the Beinecke Library at Yale (MS 442). I examined the manuscript years ago from a codicological viewpoint and believe it is of prime importance for the genesis of the Decretals. Do you agree? Prof. Derolez! It is an honor to find your message here. Indeed I think Beinecke Ms. 442 is of central importance for understanding the early development of the False Decretals and perhaps also the aims and the identity of the forgers. In particular, after many hours with the codex, I have come to believe that it represents an early version of the so-called A1 recension. In fact it is a unique witness to this early form. The massive codicological and other interventions (inter alia, the dismemberment of quires, the withdrawal of some leaves and the addition of others, the erasure and recopying of entire texts in different positions, etc.) have served at least two purposes: 1) They represent an attempt to bring this early version of the A1 recension into closer alignment with slightly later (from the perspective of the redactors, perhaps “newer”) versions of the False Decretals. And 2) they reflect knowledge of and access to a non-Gallican Hispana, which has been used by the correctors in Ms. 442 to improve, systematically, many of the corrupt readings that Pseudo-Isidore had from his own corrupt Hispana Gallica. I think the correctors of Ms. 442 likely enjoyed very close relations to the forgery enterprise, as they are finally able to expand the False Decretals with additional items from the same pool of sources that Pseudo-Isidore himself used.